How are you going to carve your pumpkin this year? Are you going to him into a gruesome gourd of horrible fright? 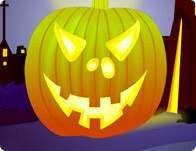 Or are you going to transform this super squash into a spooky pumpkin with a goofy face? Don't forget to light the candle in your pumpkin to make him particularly frightening when the trick-or-treaters come around!